Resplendent angelfish larvae (Centropyge resplendens) were raised from captive-spawned eggs at 77-79F on wild copepods and artemia. The larval duration was 62 days. First record of Resplendent angelfish culture. The Resplendent angel (Centropyge resplendens) is only known from Ascension Island, mid Atlantic Ocean. There it occurs on rocky sand beds at depths between 15 and 40 meters. Back in the 80’s and 90’s it was brought in to the US occasionally. Now the Ascension government has prohibited the collection and export of all reef life including this species. The fish grows to about 3 inches. It prefers water between 74 and 80º F. My captive-bred specimens thrive on crushed flakes, small pellets (1 mm), grated gel diet, newly hatched baby brine shrimp and cyclo-peeze. Left: A pair of Resplendent Angelfish. Right: 70-day-old juvenile Resplendent Angelfish. The World Conservation Union (IUCN) has placed the Resplendent Angel on its Red List of Threatened Animals (1996). 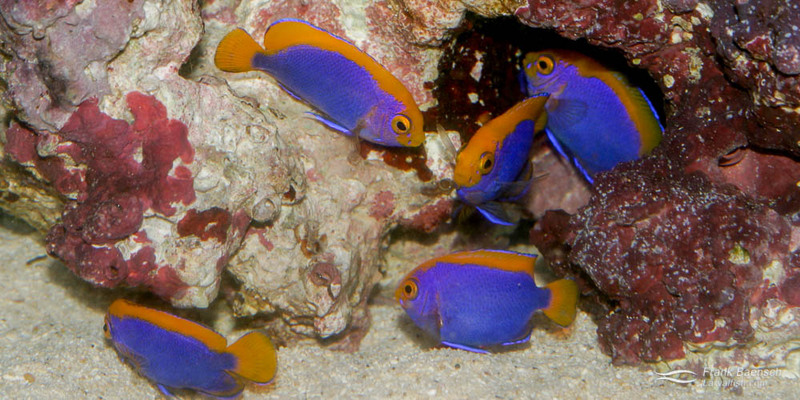 It is the only marine angelfish species on this list. While this species is common in Ascension’s coastal waters its population size is considered vulnerable because it is restricted to a tiny island locality.